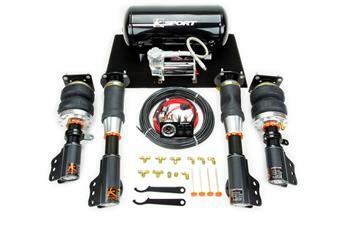 Ksport Airtech Air Suspension System - Basic MAZDA - MiataRoadster - Stay tuned with MiataRoadster! Unlike air bag suspension systems of the past where consumers must piece together a complete kit from scratch, often at a compromise to reliability and performance, KSport’s revolutionary Airtech Suspension System comes as a complete, model specific kit that is 100% bolt-on with no custom modifications needed. Each Airtech Suspension System is fully developed for a particular vehicle with model specific dampers, air compressors, lines, wiring harnesses and instructions. KSport is proud to kiss the incomplete air bag suspension systems of the past, goodbye! All Airtech Suspension Systems include KSport’s monotube coil over dampers with air bags that are pre-installed at the factory. All dampers utilize billet, 6061 aluminum components with zinc electroplated steel shafts that are resistant to salt, rust, dirt and other harmful environmental conditions. The dampers offer 36 levels of adjustment, simultaneously altering rebound and compression. Ride height is adjusted through the air bags which can be controlled internally in the cockpit, or remotely with KSport’s award winning keyfob-style height adjustment controller. Height adjustment can also be performed on the damper itself by using KSport’s unique adjustable mounting technology, which allows height adjustment without sacrificing suspension travel or ride comfort. Airtech Suspension System kits come complete with Viair air compressors, all necessary wiring and plumbing materials, instructions, and height adjustment controls for in-car and remote use. With the convenience of Airtech’s bolt-on installation, excellent ride comfort and versatility, KSport has changed the way enthusiasts approach and utilize high quality air bag suspension systems. With no compromise in quality, safety and performance, Airtech Suspension Systems are a must have item for anyone interested in leading-egde technology, at a competitive price.